Are you a lover of tapioca pudding? I am and would always be. I’d like to cook a tapioca dessert and enjoy a warm night especially in winters. During our trip back to Hong Kong last month, I’ve tried baked tapioca custard, a non-Asian variation of tapioca pudding, several times at a Chinese restaurant. Not only was the dessert not expensive, but also was it downright sensational. Its smooth and creamy texture satisfied all the taste buds. 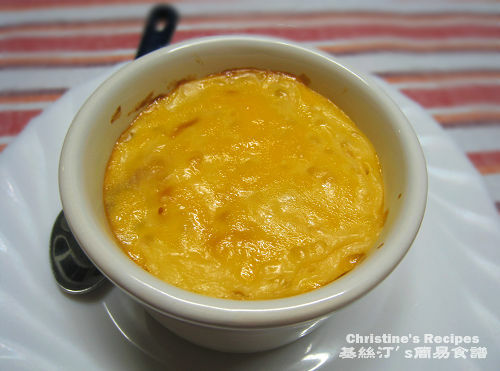 Inside the baked tapioca custard, they added some sweet lotus paste, a popular way of presenting this dessert, I guess. Well, I felt my husband seemed not to be into the lotus paste though. Having come back to Australia, I got some time to play around and experiment baking my own version of this sensational dessert. Instead of putting lotus paste, I prepared some red beans that were cooked with a little piece of rock sugar. While baking the dessert, my husband proclaimed that he had had enough in Hong Kong and didn’t want to eat any more. What happened then? He finished a big bowl when the custard turned onto our dinner table. Surprise. Soak tapioca pearls in water at least 20 minutes. Drain well. Cook in plenty of boiling water on medium heat for 10 minutes, uncovered. To avoid scorching, stir constantly while cooking. Turn off the heat, cover with a lid and let them stay inside the saucepan until translucent. Drain tapioca pearls and rinse under cold water. Drain well. Add custard powder in 100 ml milk, stir in the beaten egg. Set aside. Use a small saucepan, pour in evaporated milk and the remaining milk, together with sugar and butter. Heat the ingredients until butter dissolved and combined well. Stir in the egg mixture (3) and continue to cook. Stir constantly while cooking until thickens. Lastly, add cooked tapioca pearls. Place ramekins in a tray half filled with water to keep custard moist while baking. Bake for 15 to 20 minutes until lightly brown. Serve hot. It is important to soak tapioca pearls before cooking. They will swell up and become entirely translucent in shorter cooking time. Don’t let tapioca pearls be unattended while cooking. Remember to stir occasionally. The baking time will vary depending on different powers of different ovens. Love to hear from you again once you bake this tapioca to see how your hubby likes it. If I use sweetened condensed milk do I still add the sugar? If you use sweetened condensed milk, adjust the amount of sugar depending on how much condensed milk you use. Sorry, I don't get what you mean. Convert to what? Grams is a measure of weight, so it stands to reason that the conversion would be to ounces. Go to http://www.metric-conversion.biz/convert+grams+to+ounces.htm for a conversion table. when i soaked the tapioca pearls in water it sure turned into paste-like...do you really have to soak in water before boiling? 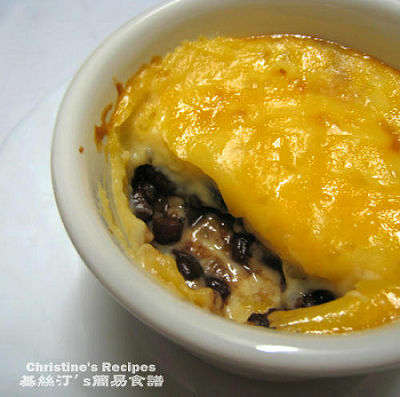 thanks for your help?..really want to try this recipe..looks yummy. Soaking before cooking would shorten the cooking time, and help the tapioca pearls easily cooked through, with the center softened. This recipe was so quick and easy and absolutely delicious..
hi, is it possible to leave out the custard powder? You could replace with an egg yolk, or else the taste would be too bland and colourless. When you say that you can replace the custard powder with an egg yolk, that is purely just the yolk (removing the egg white), is that correct? 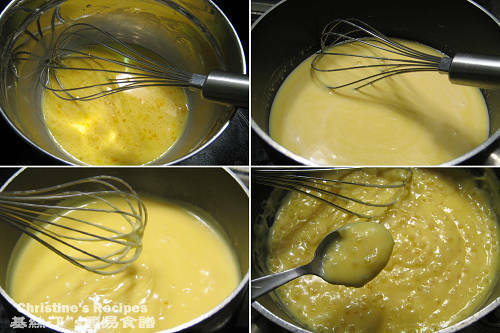 The custard powder is to add yellowish colour into the cookies. If you can't find any custard powder, you can replace with an egg yolk. Yes, no egg white. Bear in mind that the end products would be a bit different in texture, if using egg yolk. Do you have a recipe for lotus paste? Yeah, got a lotus paste recipe here. May I know where can I buy the tapioca pearls? It's available at Asian grocers. Your recipe sounds delicious and am keen to try it out. Can you use sago instead tapicoa? If I can, do I need to adjust cooking time or instruction? Sure, you can use sago instead. The method is basically the same. But you have to adjust the cooking time that depends on the size and amount of sago you'd add. Feel free to experiment it.